This is a slightly sharp jelly, well suited to accompanying cold meats, or cheeses. We picked some rhubarb for the local Show (had 2nd place with it) and I have struggled to think of something to use it for, because somehow to me, rhubarb is linked to the first fresh fruit of the season in Spring. However, after the success of the lavender flavoured jelly, I thought I'd see how a rhubarb one came out. Our rhubarb is a variety with stems mainly green in colour, hence the golden colour of the jelly, but if yours is a redder variety, the end result would be pinker, I'm sure. 3. Boil for 45 minutes and leave to cool for 15 minutes. 12. 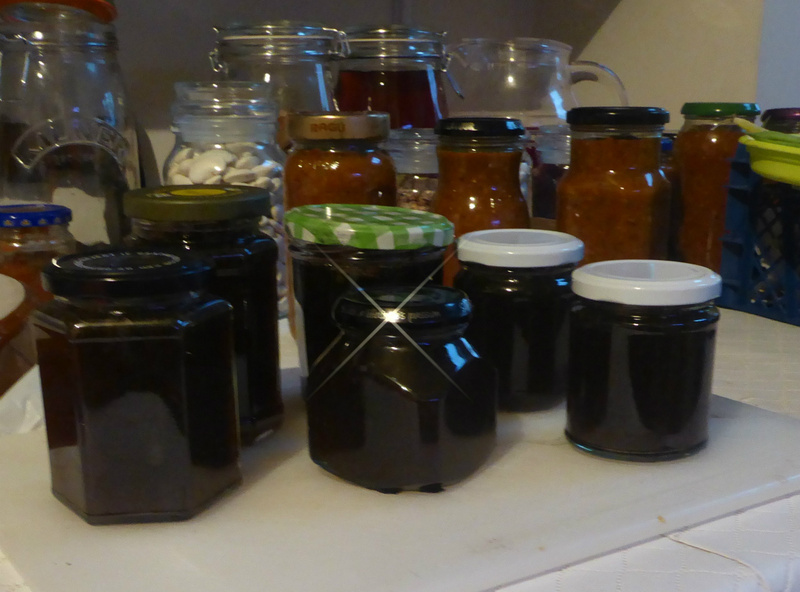 Ladle the jelly into the jars, filling to the shoulder, wipe the edges of the jar mouths and put on the lid. Using lavender as an ingredient in anything does run the risk of the end result either tasting of perfume, or slightly medicinal, so I have refined the method to try to control this more. white granulated sugar: 1kg per 1l of apple juice , once "dripped"
8. Take the bowl away from under the jelly bag before moving the bag... saves accidentally dropping apple flesh into your carefully strained juice! 12. Warm slowly, stirring until the sugar is dissolved,and then add your lavender flowers, whole. 13. Bring to the boil. Turn off the heat and leave for 20-30 minutes. Taste after 20 minutes to check the level of flavouring. Add food colouring at this point if you want to... a very tiny bit! 19. Ladle the jelly into the jars, filling to the shoulder. 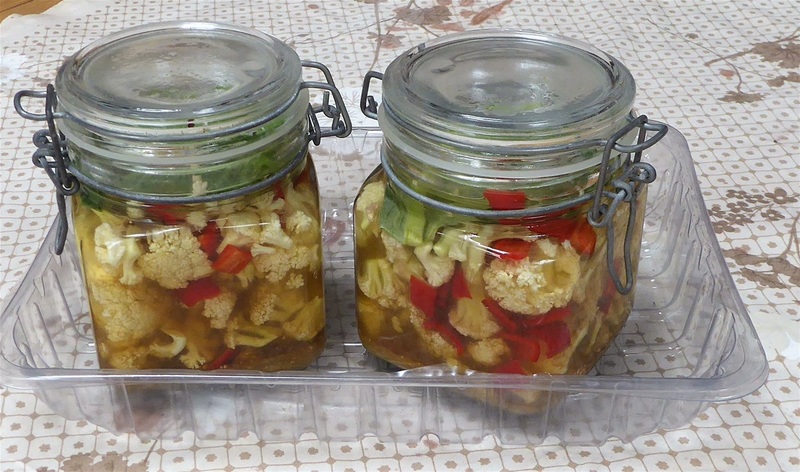 Carefully wipe off any spillage from the necks of the jars and put on the (dried) lids. Leave them to set, being very careful if you need to move them before then. 6. Label, and store in a cool dark place. I included the lemon to increase the acidity, and it turned out to be a great addition, adding extra texture and another flavour dimension too. We ate some last night with burgers, and although it is a bit thick for dipping chips into, t could be made slightly thinner I guess. I can se it being rather good spread on hot cheese on toast, or in a cold chicken sandwich. A useful addition to our larder! 8. Once the syrup is ready, remove the cinnamon sticks and ginger slices. You can push these in amongst the fruit if you like. The ginger will be luscious! 9. 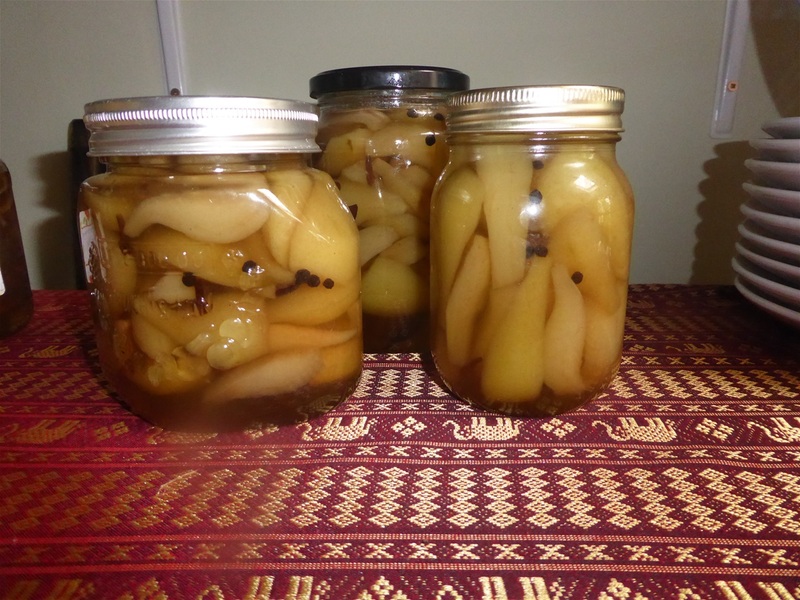 Pour the hot syrup over the pears, filling the jars to within a centimetre of the top. Carefull get rid of any airbubbles with a clean wooden skewer, Wwpe the edges of the jar and screw on the lids. You can eat them after about a week, but they keep for at least a year with no trouble. You can vary the spices of course. I used the for this batch as it is what my Mum did, but Star Anise or Cardamom would be good with the pears, so should there be more pears come my way, I shall give these others a go. 7. Remove the pan from the heat, take the jars out of the oven. This is very good with cold meat, or in place of redcurrant jelly with roast chicken, as well as to accompany cheese, especially richly flavoured cheddar! 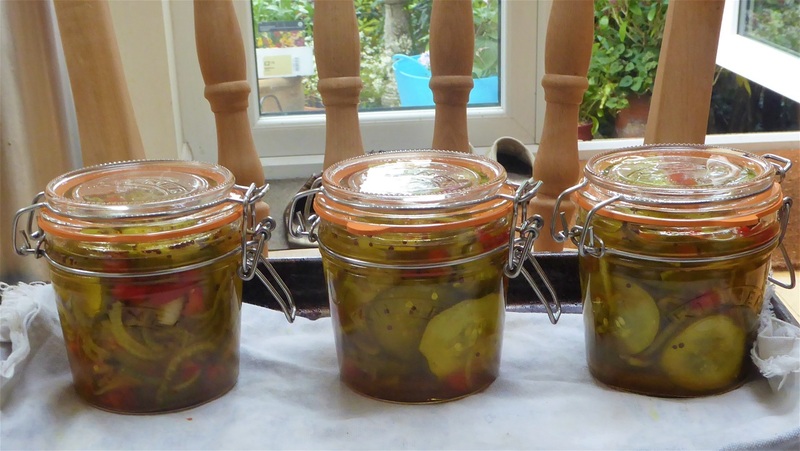 Cucumbers are still being produced virtually daily from the three Diva plants in the polytunnel, and this slightly spicy relish puts them to good use. Whoever would have thought we would still be harvesting cucumbers into October? 7 cucumbers - mine were 8ins long - thinly sliced. 1. Put the cucumber, onion and peppers in a large bowl and mix in the salt. Leave overnight. 4. Now use enough heat for a steady simmer, and cook until the chutney is thick and unctuous, and there is no "loose" vinegar evident when you make a channel across the mixture to expose the bottom of the pan. This took 40 minutes, but it could take longer depending on how juicy your fruit and vegetables are. This needs to sit for 2 to 3 weeks to mature and will easily keep in a cool dark place for about a year. 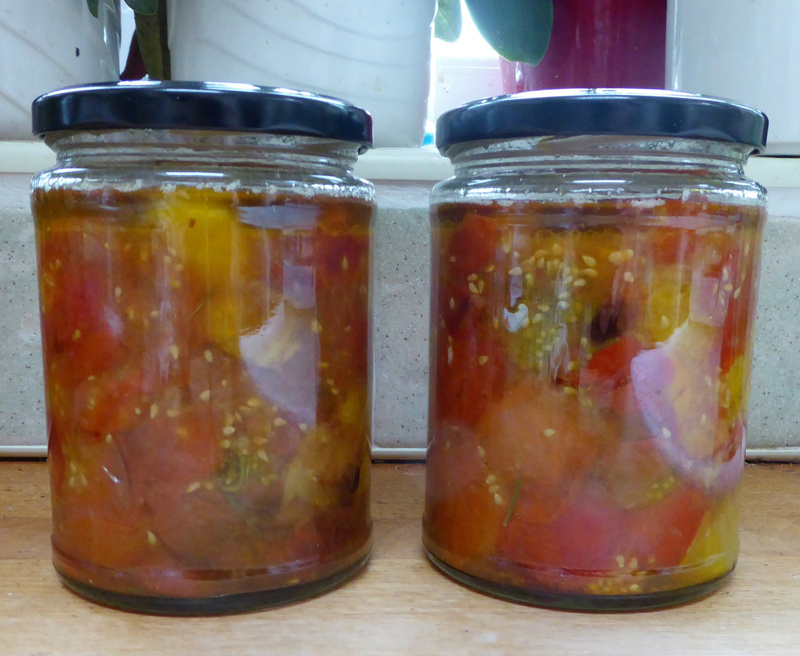 There was a little bit that I couldn't sqqueeze into the jars, and it did taste rather good. I am looking forward to eating this with cheese and biscuits, in sandwiches with cold meat and stirred into stews too. This recipe was adapted from one of Dave Dakin's, so thank you to him, although whether he intended it should be quite so volcanic I am not too sure. 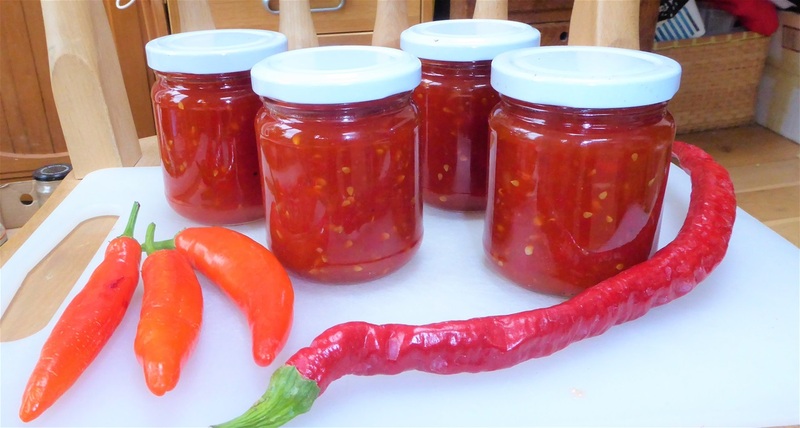 If you would like a milder version, substitute less hot chillies, such as cayenne, or reduce the number included to your taste. 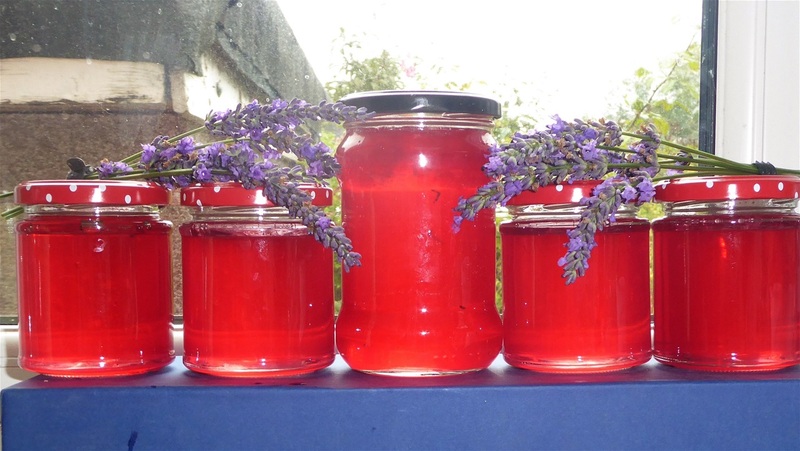 It is quite a flexible recipe really, and is a beautiful colour in the jar. Words of warning though, if you do use hot chillies: be careful not to get juice in your eyes, wear gloves to prepare them and when washing the pan, add hot water slowly or the sudden release of chilli oil into the air can be breathtaking, quite literally! 1. Using a food processor, in several batches, finely chop the peppers, chillies and tomatoes. Add some of the vinegar to make the mixture more fluid if needed. 3. Bring to a rolling boil and continue to cook until it is thick and is almost ready to set (I cool some on a saucer from the freezer and if it wrinkles a tiny bit when pushed it is ready) You do not want it too thick so slightly runny is good. 5. This stores for several months in a cool dark place... approach with caution if you have used chillies with a lot of bite! The jam is good as an "on the side" chutney with biryani, or to accompany cheese, cold meat etc. This is excellent with lamb, or in a cheese sandwich come to that! It makes good use of those windfall or maggoty apples, and the last big harvest of mint from our plot this year. 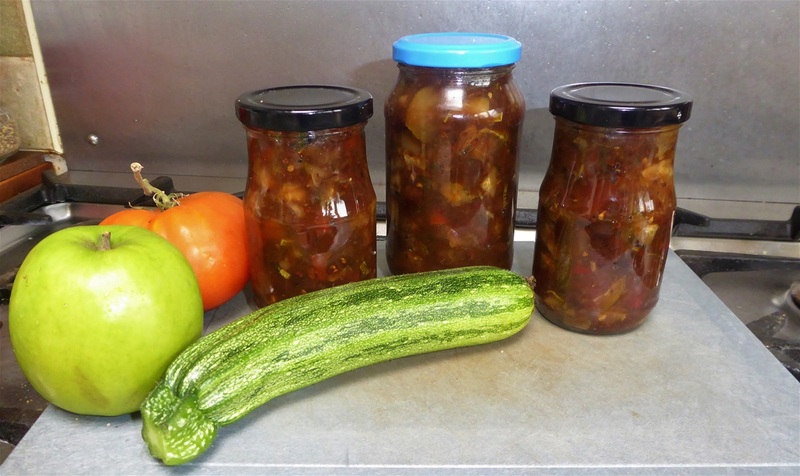 It is one of those recipes that start with very vague quantities but later on you can see how the balance works out, to arrive at a reasonably savoury jelly. Apples. Any that are damaged and need to be used up, or perfect fruits. 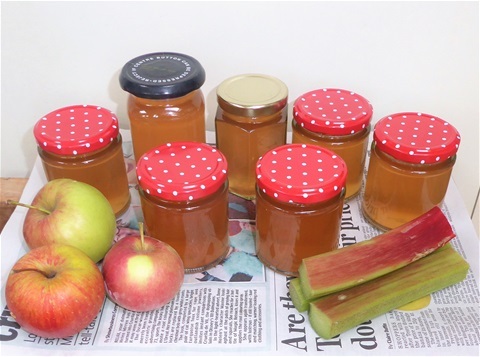 Cooking apples, eating apples, a mix of apples, anything except crab apples as these are best kept for their own special scented jelly. 1. Wash the apples and cut out any rotten, bruised or maggoty bits. Do not peel them or remove the cores (Unless they are rotten) as this makes sure there is plenty of pectin to set the jelly. Chop them into small pieces or blitz in a food processor until around a centimetre or so in size. 2. Put in your preserving pan with enough water to come about half way up the apples in the pan. If you put in more it does not matter, it just means a longer boiling time at the end. Add the big bunch of mint. 3. Cook for about 20 minutes until the apple is very soft and the contents of the pan looks like mush with mint stems in it. 4. Tip this mush and stems into a jelly bag and leave to drip over a large bowl for about three hours. Do not squeeze the bag if you want the jelly to be clear. 5. Put a saucer or small plate into the freezer to use when you test the jelly for a set later. Make sure you have sterile jars warming, and pour bioling water onto the lids in a small bowl. 6. Measure the juice before pouring it back into the (washed) preserving pan, with the measured amount of sugar and the vinegar. Another tomato recipe! This one makes a change from chutney or sauces and again, uses a nice lot of tomatoes if you need to reduce your personal tomato mountain. You can also make a smaller quantity perfectly well of course! This quantity makes two 350ml jarsful. 7. When the tomatoes are shrunken and slightly dark around the edges, they are done. The time this takes depends on the juiciness of your tomatoes. The first batch took 2hrs 15mins but the second was ready after 1hr 45mins. 8. Taken the tray out of the oven and remove as much of the garlic as you can - this does not always preserve well and might affect the tomatoes. 9. Carefully transfer the tomatoes into the warmed jars. Use a bamboo skewer to ensure there are no trapped airbubbles. 11. Put on the lids. Opinions vary as to how long this stores for. In a cool place it should last at least three months and I would actually be expecting six. Keep the oil topped up to cover the tomatoes if any are sticking up after you take some out.If you keep the jar in the fridge, the olive oil may solidify. Don't worry, it will be fine as it warms up again, it is perfectly normal. 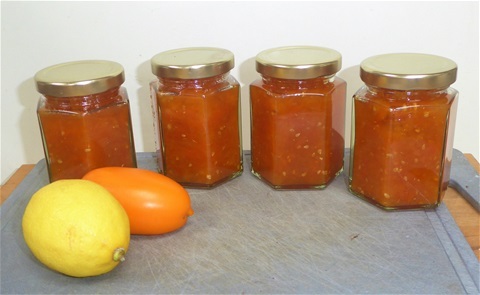 The totmatoes are delicious spread on hot toasted bread, added to a home made pizza topping, as an addition to pasta sauce, sliced into a salad, or as a side dish with a barbecue. I am sure you will think of plenty more ways to use them. There are lots of "cook-in" sauces available commercially, and their list of ingredients is many and varied, not always something I would necessarily want to eat. The convenience of being able to open a jar of sauce, add it to some meat, fish, lentils or other vegetables and quickly have a tasty meal is very tempting, so I tried to come up with a home made version... and this it it! I make several batches each year with different flavourings, to see us the year round. 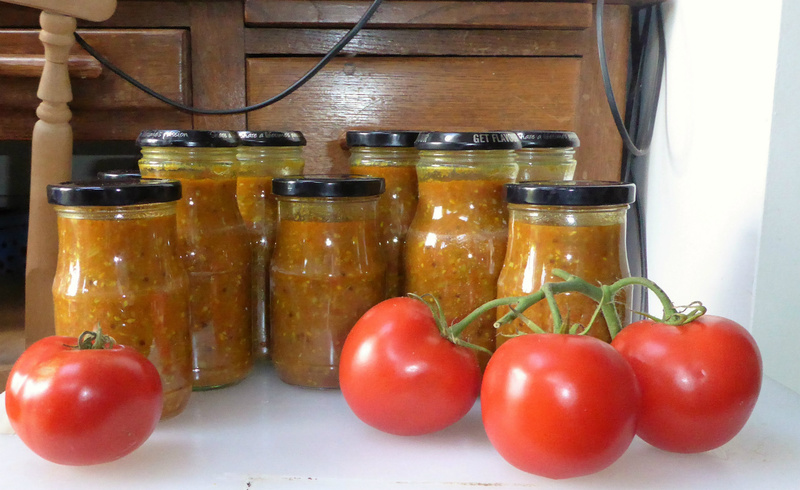 We don't have enough freezer space for this amount of tomatoes, so these jars of sauce enable us to preserve our bounteous harvest in a practical way, with a method used for many years before refrigeration was an option. The basic recipe can be varied to suit your personal taste by adding spices or herbs, or leaving it plain to be added to when you use it. 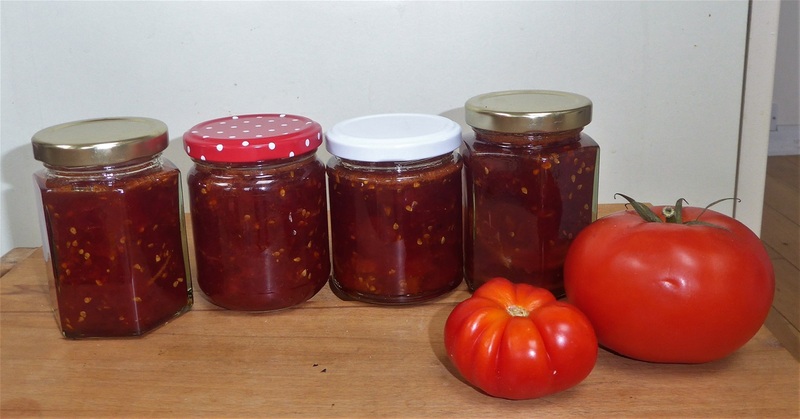 There is one vital criteria however: you must have at least 7 cups of tomato to no more than 4 cups of the other vegetable ingredients to ensure the balance of acidity allows the sauce to be kept safely without danger of botulism. Read through the whole recipe before you start to ensure you will have the equipment you need to hand for waterbathing the finished sauce. spices or herbs to taste - just think of the number of jars you will be making and what quantity you would use for that volume. In this batch I used 5 heaped tsp each of black mustard seeds, ground cumin and ground coriander, 5tsp grated fresh ginger, 3tsp ground turmeric and 5 large red chillies, which were chopped with the onions and garlic. 1. Sort out your jars and lids and sterilise them - this quantity makes between 2.5 & 3l of sauce, depending on how much your veg cooks down...coriander cooks down far more than runner beans for example. I find 350ml jars a useful size. 5. Put the tomatoes in a food processor and blend until well chopped (You can also chop them by hand of course) and then add them to the pan. 7. Now bring to the boil and simmer for 15 minutes, without a lid on the pan. 8. Warm the jars, sterilise the lids and get the waterbath ready - part-fill a large pan with boiling water. You will need a trivet in the bottom to stand the jars on, so that the glass is not in direct contact with the metal pan. 10. Pour the sauce into jars and put on lids immediately. Do not overtighten the lids though as air must be able to escape when the jars are in the waterbath. Fill the kettle and boil. 11. Now carefully stand the jars on the trivet in the waterbath. Use an oven mitt to protect your hands as the jars and the water are both hot! 13. Keep the water at a high simmer for 20 minutes and then carefully lift out the jars. Tighten the lids slightly, and leave to cool. If you have pop-in centres to the lids, you will hear them pop down as the sauce cools. This sauce keep safely for over a year in a cool, dark place. We find it especially enjoyable in the long dark days of winter when there is little variety in fresh crops: a lovely reminder of early Autumn flavours! This is the healthiest, tastiest version of tomato ketchup I have ever had, and you may well think the same! 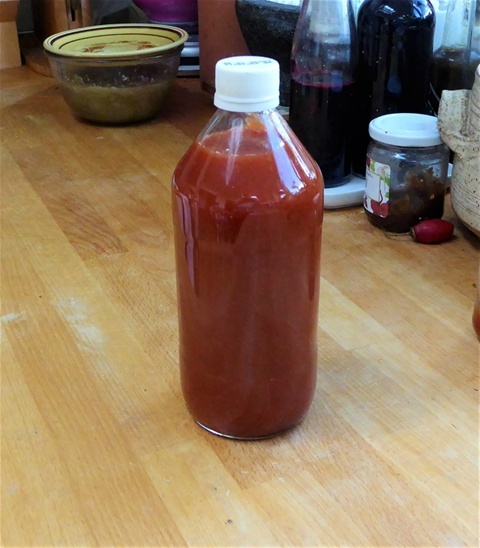 This is the first year I have made it, and it is so good I have already made a second batch. 2kg of tomatoes are needed for 500ml of sauce, so it certainly made a dent in the tomato mountain in our kitchen right now! 7. Taste, and add more sugar if required. 8. Using a funnel, pour into a sterilised bottle and screw on the top immmediately.